Do you have a cat that just loves to rip and shred your furniture? Well, if you do, you might want to check out the SmartCat Bootsie’s Three-in-One Cat Scratcher. It is a great option to go with if you need to provide your cat with something to scratch other than your nice furniture. Of course, there are many different scratchers and scratch posts for cats out there, and many of them are quite different. Today we want to take a closer look at the SmartCat Bootsie’s Three-in-One Cat Scratcher. It might be quite simple, but it does the job done. The SmartCat Bootsie’s Three-in-One Cat Scratcher is a fairly modern cat scratcher option. It’s a cool option because you can leave it on the ground or you can mount it on a wall. Therefore, you can make this a vertical or horizontal scratcher, or you can make it a combination vertical and horizontal scratcher. While this is not your classic cat scratcher, at least not the look of it, it is really not much different than other carpeted or fiber scratchers. It allows your cat to really dig their claws into something, something other than your nice reclining sofa chair. The SmartCat Bootsie’s Three-in-One Cat Scratcher is fairly inexpensive, which is an added bonus. If you have a cat, the SmartCat Bootsie’s Three-in-One Cat Scratcher is probably a good option to consider. We would especially recommend this for people with indoor cats, people who have their furniture shredded on a daily basis. Cats will be attracted to the SmartCat Bootsie’s Three-in-One Cat Scratcher so they don’t mess with your furniture. It is a good choice to go with if you have a smaller home, as it can be wall mounted, which is pretty cool as far as we are concerned. It is also a good option if you need something that is going to last for quite a while. All in all, we think that the SmartCat Bootsie’s Three-in-One Cat Scratcher is one of the best cat scratchers around right now. Once again, there is really not all that much to say here. When you buy the SmartCat Bootsie’s Three-in-One Cat Scratcher, you get the scratcher itself. The scratcher is made of fibrous materials that your cats can really sink their claws into. The material is fairly durable, makes a good noise, and will satisfy your cats. The middle is the scratcher, but at each end, there is a wooden block. Both blocks have rubber feet to keep it in one place while on the ground. However, there is also a simple wall mounting system included so you can mount it on a wall. Other than that, there is nothing included in the packaging with the SmartCat Bootsie’s Three-in-One Cat Scratcher. First and foremost, we like how the SmartCat Bootsie’s Three-in-One Cat Scratcher is made with really durable woven sisal. In our opinion, this is probably the best material that could be used for a cat scratcher. It feels good under the claws, it makes a good noise, it doesn’t make a big mess, and it is quite durable too. 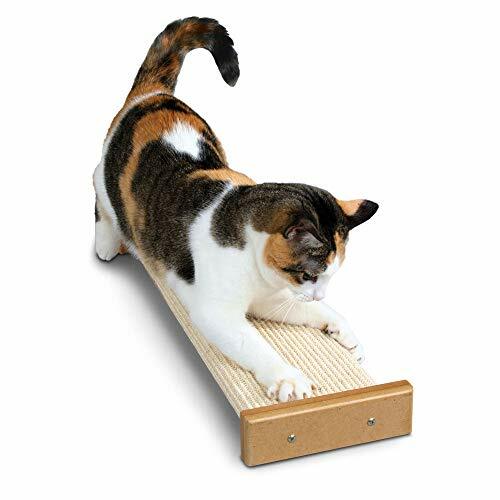 Moreover, the wooden blocks on each end are designed to keep it in one place when the SmartCat Bootsie’s Three-in-One Cat Scratcher is being used as a horizontal scratcher. It comes with rubber feet so it won’t slide around on the ground too much. At the same time, the convenient wall mounting system allows you to mount this on any wall. It is a good thing to have if your cat wants a vertical scratcher, but you don’t have too much space in your home. You can also hang this scratcher up so that only a portion of it is vertical while the other half is horizontal. There is not much to be said in terms of the installation here. All you really need to know about is the wall mounting system. Simply find the stud in the wall you want to attach it to, screw the mount into the wall, and attach the SmartCat Bootsie’s Three-in-One Cat Scratcher directly to it. Other than that, there is really nothing else you need to know to use this scratcher. In terms of alternatives, you could go with a cardboard scratcher like the Pawmosa Cat Scratch. The Pawmosa, instead of being made out of sisal, is made from cardboard. It is a little cheaper to buy, but it is also less durable, won’t last as long, and it will make a bit of a mess too. However, the benefit is that it is already a fully ready vertical and horizontal scratch that even doubles as a bed. There is no wall mounting required with the Pawmosa. The SmartCat Bootsie’s Three-in-One Cat Scratcher is a really nice option to go with if you really need your cats to stop ruining your furniture. It’s a nice choice if you have a smaller home where a wall-mounted scratcher will save some space.